“This beast must be stopped — by not funding it. Today, Todd and I joined with many of our fellow citizens to urge those in the U.S. Senate to not fund Obamacare,” wrote former Alaska Governor Sarah Palin in an email on behalf of the Senate Conservatives Fund. "The time to take serious action to stop Obamacare is now. Join us in urging Senators — Don't Fund Obamacare! Just remember — if you fund it, you own it!" said Palin. The Senate Conservatives Fund, the PAC founded by former Senator, and now President of the Heritage Foundation, Jim DeMint is backing the efforts of Senators Mike Lee, Ted Cruz, Rand Paul and other principled limited government constitutional conservative Senators to defund Obamacare in the upcoming continuing resolution to fund the federal government. "The time for rhetoric and ceremonial votes in Congress is over," said Palin. While not targeting Speaker of the House John Boehner or other members of Capitol Hill’s Republican establishment by name, Palin’s email seemed to be aimed directly at the 40-plus largely symbolic votes to “repeal” Obamacare taken by the Republican House. Speaker Boehner has made it clear he wants House Republicans to back a short-term government funding bill set at the levels of the sequester, which imposed automatic spending cuts on the government. He is not advocating that the bill strip all funds for ObamaCare. But the willingness to stand for the Constitution and the principles espoused by the Republican grassroots simply isn’t in most establishment Republicans, especially the Capitol Hill leadership. But Governor Palin has an answer for that, too. Palin’s move suggests that Defund Obamacare will play a role in her future endorsement decisions. Submitted by NQXXLQshq9 on Fri, 08/30/2013 - 10:26. Sarah is unemployed. She resigned before her term of governor was completed. She couldn't govern the least populated state in the union. What does Todd do for a living? Do any Palins have real jobs? Best we keep searching for a competent presidential candidate for 2016. It isn't Sarah. Will the real Sarah please stand up? Check this video of unscripted encounter with an Alaskan school teacher. Submitted by jwagner on Wed, 08/28/2013 - 17:42. 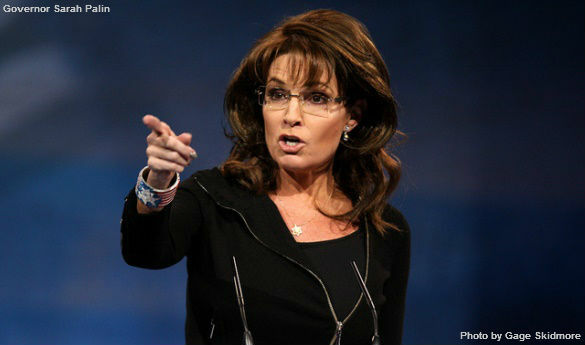 America needs Sarah Palin to run against Hillary in 2016, not as a Senator from Alaska. Submitted by al.78.1931 on Wed, 08/28/2013 - 16:32. Congress had better defeat obamacare if they any idea of trying to run again, if they do not they better run for safety else where. Submitted by jcarrollbarnhill on Wed, 08/28/2013 - 13:02. Submitted by nikkibj97 (not verified) on Wed, 08/28/2013 - 17:54. The affordable Healthcare Act is one of the greatest pieces of legislation our nation has ever accomplished. In case you people don't know it it's going to help millions of Americans who have lost their insurance through no fault of their own i. e. jobs shipped over seas and are now working low paying jobs with no benefits. Your fixation on destroying Obamacare couldn't be more wrong headed. Some of you in here are following rich insurance companies propaganda and you're doing it against your own interest only because it took a black president to get it done no question about it. As for Sahah Palin we have seen her we've heard her and our nation said no to her. She's going nowhere and I challenge you about her smarts. There is a site on the internet with Palin saying's please find it read them nothing has been edited the words are her own. I'll say IT again forget about doing away with Obamacare it's the law of the land and the people who voted for Obama are not sitting still while the few who oppose it destroy it. IT JUST AIN'T HAPPENING. Submitted by drmaddogs on Fri, 08/30/2013 - 05:17. "...help millions of Americans who have lost their insurance through no fault of their own ie. jobs shipped over seas." Then change that problem instead of creating a new one. "following rich insurance companies propaganda "
Then fix the model where Insurance companies can be involved with such things like insuring stock loses or other allowances to where they were making a 5% net, like before the early 90;s, unlike now where 20% is the goal- higher profits = higher risk. again, fix the problem don't add another. "only because it took a black president", money knows no color other than green, quit adding the problem of Racism.
" can go back to Canada for all I care", promoting separatism (leave) is foolish, partisan and solves nothing but you're own interests, while being no answer for social malfunction or is it a answer on a individual basis as Obama signed the Veterans Bill giving authorization for the IRS to, when they decide to enforce, to attach via our BIS system 50% of ones wealth... if one decides to 'abandon' America. Nothing used in you're remarks solves a singe thing and O-Care heaps additional regulation and all additions of regulation adds costs. O-Care will be like Bush and his Drug Bill... only like on steroids. Submitted by neal.hightower1 on Thu, 08/29/2013 - 10:35. I am glad you have read all 2100 pages of ACA and the 19,000 plus regulations that have been implemented since. Oh, you haven't. You really are stupid then. And before you get all twitchy, just so you know, I am retired military and have guaranteen health care for life and my wife works for a union that has some very big companies with thousands of union members and she gets her Cadilac health care plan for free, no deductibles, no premiums. WIth that being said, and as Max Baucus and and numerous other Demowits have said this is going to be a train wreck. But I suppose you are smarter than they are. I think not, as you stated, "The affordable Healthcare Act is one of the greatest pieces of legislation our nation has ever accomplished", shows you are a slow learner. I am from Texas, also, and you get used to him being a Senator. Get a job, you dolt, quit standing around with your hand out, do something useful for a change and maybe things will get better for you. Submitted by thequadfather on Thu, 08/29/2013 - 01:26. I think I know best what my own interests are. That's why I was insured before Obamacare came along. It's not "great" legislation. It's a steaming pile of crap that spends tons of money on worthless bureaucrats and navigators. It's designed to destroy private insurance and is being further illegally manipulated to do so. It's disrupting work schedules for working class people and thus harming their incomes. It's taxes, taxes, taxes! It's higher costs as the responsible are demanded to pay for the irresponsible. It will be repealed if I can help it, whether or not anything replaces it. It's so bad that even the unions are turning against it. And what's Obama being black got to do with it? If he was all white instead of half, this bill would still be a pile of crap. Submitted by bob.lewis on Wed, 08/28/2013 - 16:19. Totally agree. We need a Cruz/Palin, Palin/Cruz ticket to get this country turned around. If we can't get that then we need to energize conservatives to get out and vote out all the RINO's. And all that won't defund obamacare are just that. Submitted by stevethird on Wed, 08/28/2013 - 14:25. Submitted by robjmillerjr on Wed, 08/28/2013 - 13:56. Maybe I don't understand the process but here is my take on Sarah, Mike, Ted, et al. Isn't it a pipe dream to actually believe Obamacare can be defunded??? If the House votes that way, the Senate probably won't; but if the Senate does agree by some miracle, Obama will veto it. That leaves us right where we were. I agree with taking this stand; but be realistic for crying out loud. It is all for naught. Submitted by neal.hightower1 on Thu, 08/29/2013 - 10:38. You'll feel better. Let Obama shut down the government.